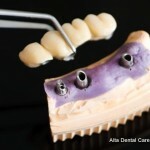 Home/Blogs/What is a Dental Bridge? Have you ever wondered, “If I was missing two or three teeth, how could a dentist ever repair my smile”? Well, that’s literally what dentists do when they create a special set of dental fixtures. “What is a dental bridge?”, you ask. It’s a dental fixture which puts one or more crowns in place to close an extended gap between teeth. The bridge, as its name suggests, is anchored at one or two ends by nearby teeth, and the stand-in tooth acting as a placeholder is called a pontic. The pontic can be made of a variety of substances, including gold, ceramics, or alloys. The abutment teeth are the teeth being used as anchors for the bridge. There are at least three types of bridges which your dentist can offer you, ranging from traditional to Maryland-bonded. The rarest of them is the cantilever type, which was popular for those who only had anchoring teeth on only one side of the gap, but it has given way to the traditional type. The traditional bridge is the most common, and often involves one abutment tooth on either side of the void left by the missing tooth being selected. It may be an implant or a crown which needs to be created, and the pontic is then attached to a wing which is connected to it. A third type is the Maryland-bonded bridge, which is usually made of porcelain or sturdy plastic which mimic teeth and gums, which are supported by metal or porcelain wings. These wings are bonded to your natural teeth, for a seamless look.